British Gas owner Centrica has said it plans to raise gas bills by 12.4% for its 10.7 million customers. The firm's electricity customers will also face a 9.4% increase in their bills from September. British Gas said "unprecedented high wholesale energy costs" had made the price increases necessary. News of the fresh round of price rises came as British Gas reported record losses of £143m during the first six months of the year. Earlier this week, rival EDF Energy announced it would be raising gas bills by 19% from next Tuesday, while Scottish Power said two weeks ago that it would also be increasing bills. British Gas increased prices by 22% in March, but since then the cost of wholesale gas has risen by 30%. "Gas prices for the fourth quarter of this year stayed extremely high and, faced with substantial losses in British Gas Residential Energy, we have had to take the difficult decision to raise retail prices again," said Centrica's chairman Roger Carr. But price comparison website Uswitch condemned the latest round of price rises at British Gas. 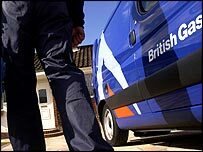 "The public assurance given earlier in the year by British Gas following their record price rises in February have been rendered meaningless to their customers today," said Anne Robinson, Uswitch's director of consumer policy. "They face further price rise misery in what has become the 'annus horribilis' for UK households," she said. The British Gas price hike in March prompted some customers to switch supplier, and by the end of the six month period 432,000 energy accounts had been lost. Mark Todd, head of Energyhelpline, said the recent price rises announced by suppliers would probably continue for the next year. He urged consumers to "protect their interests and actively seek the best deals on the market" to save themselves on average £400 per year. The losses at British Gas led to Centrica seeing overall pre-tax profits drop from £894m to £569m in the six months to 30 June. "Continued volatility in winter gas and power prices in the UK provides further uncertainty for the second half of the year," said Centrica chief executive Sam Laidlaw. Centrica said it would concentrate on "driving cost reductions and improving customer services as well as accessing competitive new sources of gas and power". The firm intends to build a new power station at Langage in Devon and has agreed a new coal-linked contract with the massive Drax power plant in North Yorkshire. Centrica said expansion in Europe remained "high on the management agenda", while in North America the firm would continue to target business customers in Canada, Northern US and Texas.